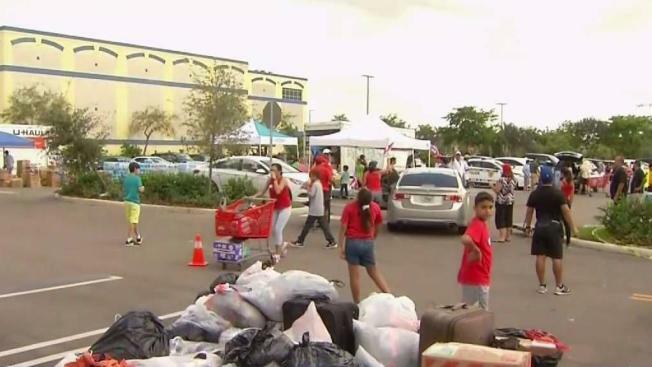 NBC 6 Reporter Erika Glover shows how American Airlines is offering ways for their employees to send supplies to Puerto Rico for free. In northwest Puerto Rico, people began returning to their homes Saturday after a spillway eased pressure on a dam that cracked after more than a foot of rain fell in the wake of the hurricane. A federal control board overseeing Puerto Rico's finances authorized up to $1 billion in local funds to be used for hurricane response, but Gov. Ricardo Rossello said he would ask for more. "We're going to request waivers and other mechanisms so Puerto Rico can respond to this crisis," he said. "Puerto Rico will practically collect no taxes in the next month." A group of anxious mayors arrived in the capital to meet with Rossello to present a long list of items they urgently need. The north coastal town of Manati had run out of fuel and fresh water, Mayor Jose Sanchez Gonzalez said. The death toll from Maria in Puerto Rico was at least 10, including two police officers who drowned in floodwaters in the western town of Aguada. That number was expected to climb as officials from remote towns continued to check in with officials in San Juan. Authorities in the town of Vega Alta on the north coast said they had been unable to reach an entire neighborhood called Fatima, and were particularly worried about residents of a nursing home. "I need to get there today," Mayor Oscar Santiago told The Associated Press. "Not tomorrow, today." 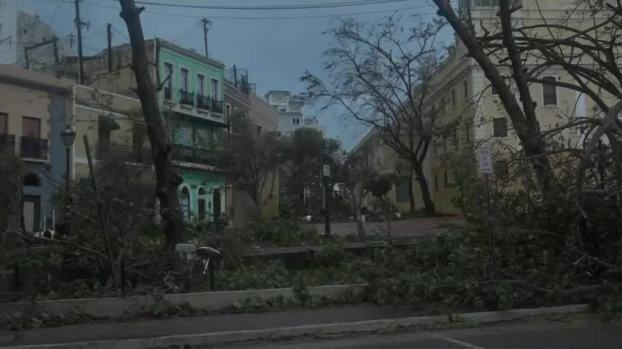 Rossello said Maria would clearly cost more than the last major storm to wallop the island, Hurricane George in September 1998. "This is without a doubt the biggest catastrophe in modern history for Puerto Rico," he said. Rossello and other officials praised the federal government for planning its response in detail before the storm hit, a contrast with what Puerto Rico has long seen as the neglect of 3.4 million Americans living in a territory without a vote in Congress or the electoral college. 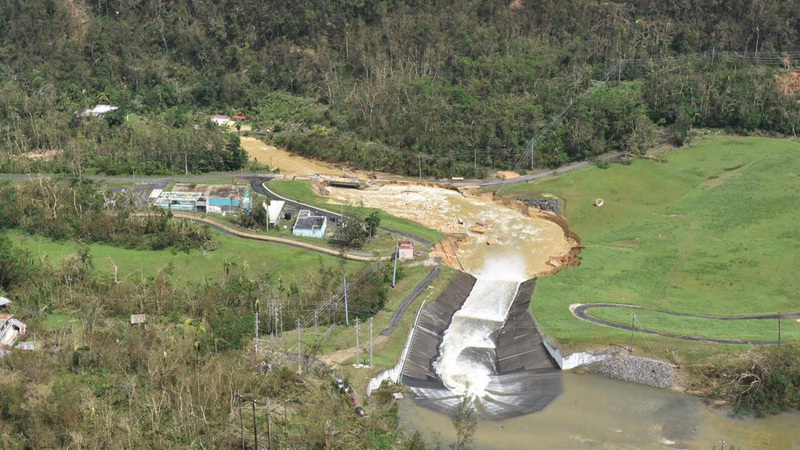 The damages of the Guajataca dam in Puerto Rico. Over 70,000 people were forced to evacuate due to the failing dam. "This is the first time we get this type of federal coordination," said Resident Commission Jenniffer Gonzalez, Puerto Rico's non-voting representative in Washington. 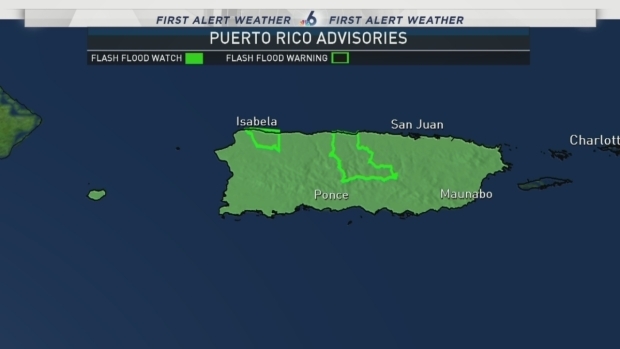 A dam upstream of the towns of Quebradillas and Isabela in northwest Puerto Rico was cracked but had not burst by Saturday night as water continued to pour out of rain-swollen Lake Guajataca. Federal officials said Friday that 70,000 people, the number who live in the surrounding area, would have to be evacuated. But Javier Jimenez, mayor of the nearby town of San Sebastian, said he believed the number was far smaller. Secretary of Public Affairs Ramon Rosario said about 300 families were in harm's way. The governor said there is "significant damage" to the dam and authorities believe it could give way at any moment. "We don't know how long it's going to hold. The integrity of the structure has been compromised in a significant way," Rossello said. Some residents nonetheless returned to their homes Saturday as the water levels in the reservoir began to sink. "There were a lot of people worried and crying, but that's natural, because the reservoir was about to break through," said Maria Nieves, 43. "They couldn't open the spillway until later in the night." The 345-yard (316-meter) dam, which was built around 1928, holds back a man-made lake covering about 2 square miles (5 square kilometers). More than 15 inches (nearly 40 centimeters) of rain from Maria fell on the surrounding mountains. Officials said 1,360 of the island's 1,600 cellphone towers were downed, and 85 percent of above-ground and underground phone and internet cables were knocked out. With roads blocked and phones dead, officials said, the situation may worsen. At least 31 lives in all have been lost around the Caribbean due to Maria, including at least 15 on hard-hit Dominica. 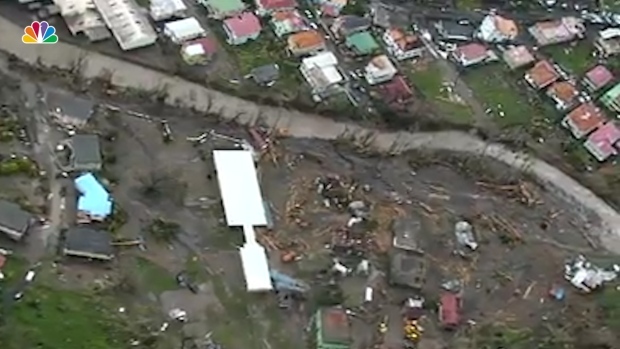 Haiti reported three deaths; Guadeloupe, two; and the Dominican Republic, one. Across Puerto Rico, more than 15,000 people are in shelters, including some 2,000 rescued from the north coastal town of Toa Baja. Many Puerto Ricans planned to head to the mainland to temporarily escape the devastation.